An operation of the Metsamor NPP for nuclear smuggling poses threat to the world. It is possible to argue that strict criminal structures deal with nuclear smuglling in Armenia. If it has not been revelead up to now, it would root from Armenian Law-Enforcement agencies and even from high-ranking government offices. 19 December, 2001 – 300 gr uranium brought from Armenia was seised in Samtskhe-Javakheti, Georgia. 26 June, 2003 – Garik Dadadyan, a citizen of Armenia was arrested in Sadakhlo-Bagratashen checkpoint between Armenia and Georgia for attempting to smuggle 170g of highly enriched uranium U-235. 13 March, 2004 - Armenian citizen was arrested in Sadakhlo-Bagratashen checkpoint for transferring radioactive materials to Georgia. 26 August, 2009 – The traces of Cesium-137 were found in Sadakhlo-Bagratashen checkpoint on the Armenia-Georgia border, in the vehicle belonging to a resident of Noratus village of Gegharkunik, Armenia. March, 2010 - Two Armenian, Businessman Smbat Tonoyan and Physicist of the Yerevan Institute of Physics Hrant Ohanyan were arrested at the hotel in Tbilisi with with 18 gr uranium. The investigation revealed that Tonoyan would sell 120 gr uranium for 1,5 million dollars. 16 September, 2010 - Three persons were arrested at Tbilisi airport for attempting to sell a small quantity of uranium and plutonium. August, 2014 - Georgian authorities arrested two Armenians in Sadakhlo-Bagratashen checkpoint for trying to smuggle Cesium 137 into Georgia. January, 2016 - Georgian authorities arrested three Armenians, also for trying to sneak Cesium 137 across the border in Sadakhlo-Bagratashen checkpoint on the Armenia-Georgia border. April, 2016 – Georgia`s State Security Service detained three citizens of Armenia and three citizens of Georgia with trying to sell $200 million worth of `Uranium-238` that was found in the home of one of the Georgians. It was revealed that detainees previously worked in Metsamor NPP. This group planned to sell `Uranium-238` to the Middle East region. Furthermore, the nuclear materials are directly being transported to Ukraine from Armenia. On 22 May, 1999, two Armenians were arrested in Beregovo, Ukraine attempting to sell 20 kg U-235. Moreover, Armenia allows the transportation of the nuclear materials to Turkey. On 29 December, 2003 , Strontium-90 radioactive material in a scrap metal shipment outbounded from Metsamor for Iran was found in Megri checkpoint on the Armenian-Iranian border. The nuclear materials are being transported from Armenia to Georgia through different directions. One of those directions is Turkey. On 24 Oct0ber, 2007, four Armenian citizens were detained in Sarpi checkpoint on the Georgia-Turkey border for attempting to transfer 2.04g of Lawrencium-103 to Turkey. This fact also confirms our argument. Well, what happens when the nuclear materials transported from Armenia are delivered to those destination? Then those nuclear materials are put on the international black market. The routes of this market have become evident since 1990s and have clearly been defined in the reports of various institutions such as CIA. 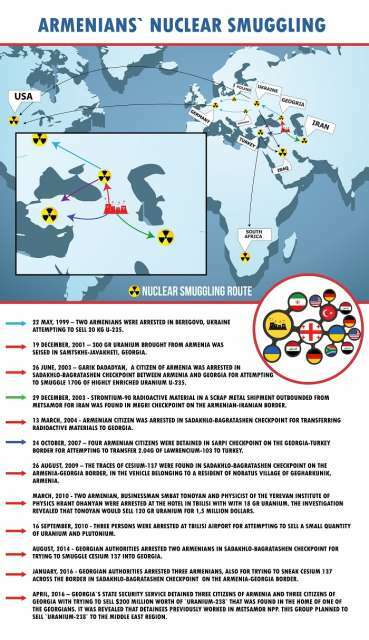 The reports made by the German police demonstrate that Germany is the main center for nuclear smuggling in Europe. 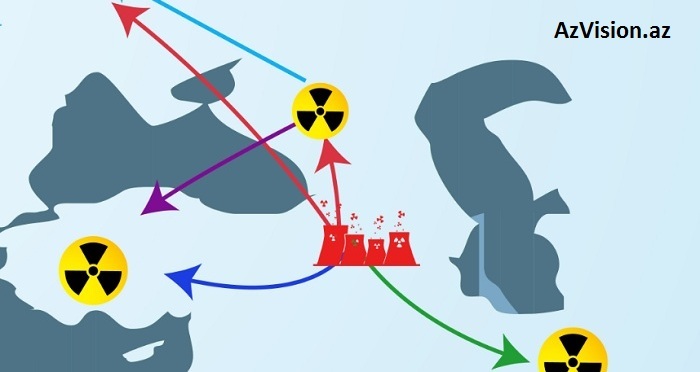 There are enough open sources to obtain information on the routes of the nuclear smuggling in the former USSR states. Mainly, the nuclear materials are being transported illegally from Georgia to Ukraine, information obtained by AzVision.az. You can read one of the articles from HERE which explores the nuclear smuggling from the former USSR states. The smugglers deliver those materials from Ukraine to Germany. Other destination is Middle East: the terrorist groups attempt to make `dirty bomb`. The representatives of the terrorist groups in the Middle East try to get illegal materials from European countries.